Use in natural and manmade ponds, lakes and fountains. Colors water a pleasing aqua-blue, enhancing the aesthetic qualities of a water body. 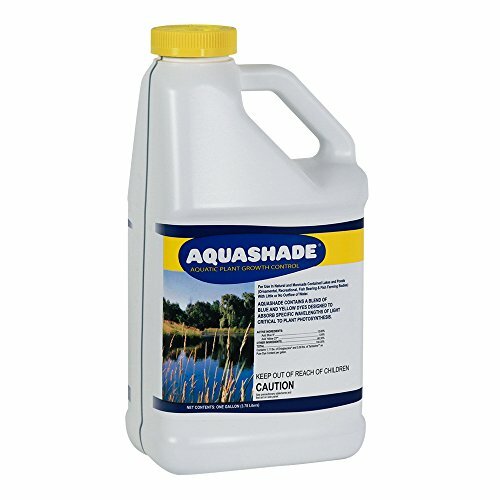 Aqua shade is a blend of blue and yellow dyes specifically designed to screen or shade portions of the sunlight spectrum (red-orange and blue-violet) required by underwater aquatic plant and algae growth. This action effectively inhibits photo-synthesis in young, bottom growth and may prevent development altogether if applied early enough in the season. Aqua shade is primarily effective at depths of two feet or greater. Inhibition of planktonic (suspended) algae blooms has also been proven. Desirable, floating leaved plants such as lilies are unaffected if they have already surfaced and concentrated product does not contact leaves directly. Aqua shade is the only ''colorant'' product of its kind which is registered by the U.S. Aqua shade is effective at a low dosage concentration. One gallon treats one acre of water with an average depth of four feet (approximately equivalent to one ounce per 10,000 gallons). Comes in 1 gallon jug. Made of 23.63 Percent acid blue dye and 2.39 Percent acid yellow dye solution. If you have any questions about this product by Applied Biochemists, contact us by completing and submitting the form below. If you are looking for a specif part number, please include it with your message.